For breast cancer survivors, getting regular exercise has several important health benefits, from lessening fatigue and the side effects that can accompany treatment to lowering the risk of the cancer returning. To achieve those health benefits, the Centers for Disease Control and Prevention (CDC) recommends that women who’ve had breast cancer take part in 150 minutes of moderate exercise or 75 minutes of vigorous exercise a week. Though that might sound like a big time investment at first glance, 150 minutes a week is only a little more than 20 minutes a day. What benefits does exercise provide for breast cancer survivors? 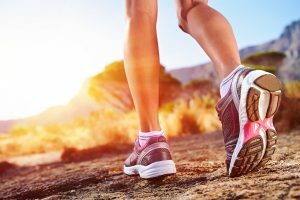 Lowered risk of breast cancer in women at high risk for the disease: Regular aerobic exercise lowers the levels of progesterone and estrogen, hormones associated with breast cancer risk, in premenopausal women, which may lower the risk of developing breast cancer for some women at high risk. It also lowers levels of insulin and insulin-like growth factor. High levels of these hormones have also been associated with an increased risk for breast cancer. Improved survival rates and a lowered risk of recurrence: Several studies have linked regular exercise, a healthy diet, and weight management with better survival rates and lower rates of the cancer returning for women with estrogen negative breast cancer. Better physical function and improved strength: Some breast cancer survivors experience discomfort and limits in the range of motion of the shoulder after treatment. Researchers found that exercise focused on the upper extremities can improve range of motion and decrease discomfort. In addition, when these exercises are started soon after surgery, they were also associated with a lower risk of developing lymphedema (swelling caused by the build-up of lymph fluid after lymph nodes are removed during cancer surgery). Better quality of life: Exercise is associated with a lower occurrence of anxiety and depression for breast cancer survivors, as well as less fatigue, which can be a result of most cancer treatments including long-term biological and hormonal therapies. Some studies have also linked exercise with better self-esteem and body image in cancer survivors. Lower risk of osteoporosis: Pre-menopausal women who undergo treatment for breast cancer can face an increased risk of osteoporosis because certain treatments cause premature menopause. That can lower estrogen levels, a hormone essential for maintaining bone mass. Some studies have found that regular weight-bearing exercise protects bone mineral density, lowering the risk of developing osteoporosis. Improved memory. A recent study linked regular moderate to vigorous exercise with improved memory in breast cancer survivors. Although post-treatment memory problems have been believed to be side effects of radiation and chemotherapy, the study’s authors linked these memory problems with the high levels of stress breast cancer survivors experience. The study found an association between higher levels of physical activity and less distress and fatigue and higher levels of self-confidence. These psychological benefits were linked to lower levels of perceived memory problems in the study’s participants. Exercise can also be important for people undergoing or preparing to undergo cancer treatment, improving mood, lowering stress, and building strength and stamina. Your doctor or a health advisor can help you build an exercise plan that’s safe and appropriate as you move throughout treatment into survivorship.